Debbie Grifka | Sew Solid Sunday! 14 Dec Sew Solid Sunday! Welcome back to the final Sew Solid Sunday of the year! I know many of you are busy sewing up a storm, so I hope you have some great solid projects to share! I’ve been thinking about making a seasonal project using holly as a motif for years. This week, it finally rose to the top of the list! I Googled some images to remind myself what real holly looks like and then set about to design my simplified version. I like the balance of things in threes, so decided on three leaves and three berries. I don’t have a full tutorial for this little mat, but I’ve included my template and a few construction notes. You can download the template here – it is already reversed for fusible appliqué. I traced the holly and berries onto the fusible web in the usual manner, applied the web to the fabric and fused them in place. The farthest right and lowest edges of the holly are both about 2 1/4″ from the raw edges of the background. 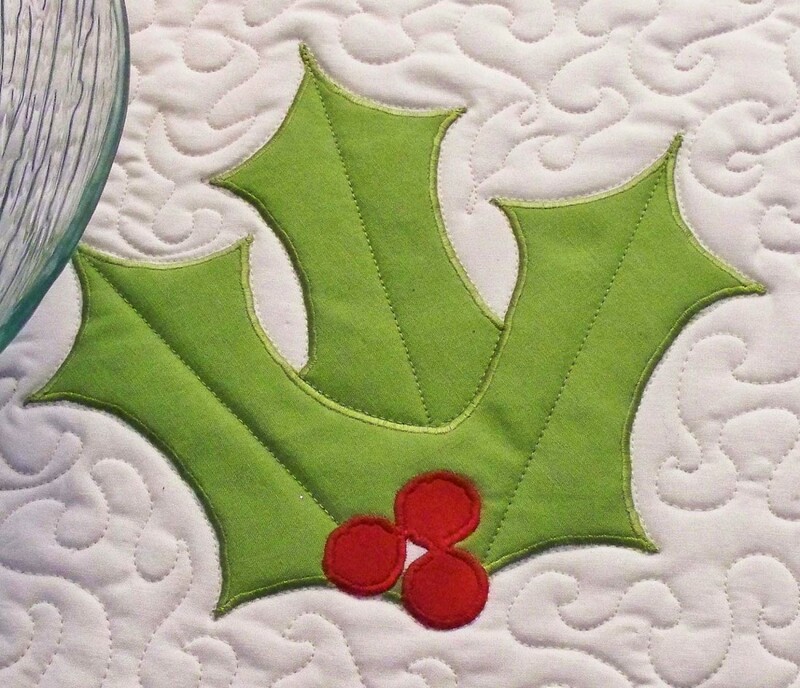 I traced the center holly leaf onto the freezer paper and lightly pressed it over the appliqué piece. 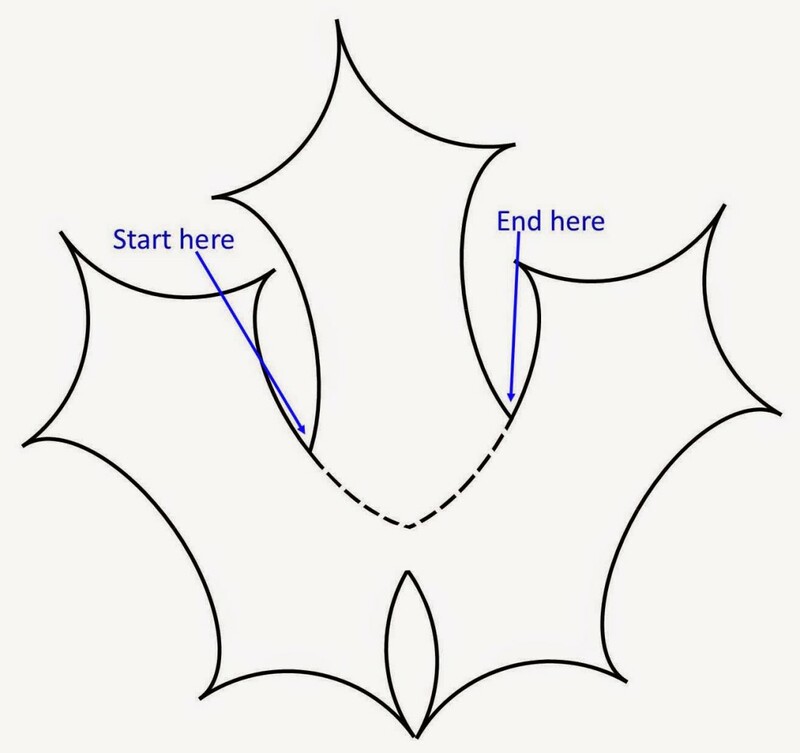 Using the removable pencil, I traced the edges of the front holly leaves where they overlap the center one. I also lightly drew in the center leaf spine of each holly leaf. To stitch the holly down, I began my first stitching where the center holly leaf meets the front two and stitched around the center leaf only. Next I stitched around the two front leaves, stitching over the line marking the front edges. This gives a bit of dimension to the appliqué. Lastly, I stitched around the berries. To complete the project, I pillowcased it in order to avoid a thick binding on such a small item. To do likewise, center the batting on the wrong side of the quilt top. Flip it over and pin it in place from the quilt top side. Add the backing, right side down and pin the edges together. 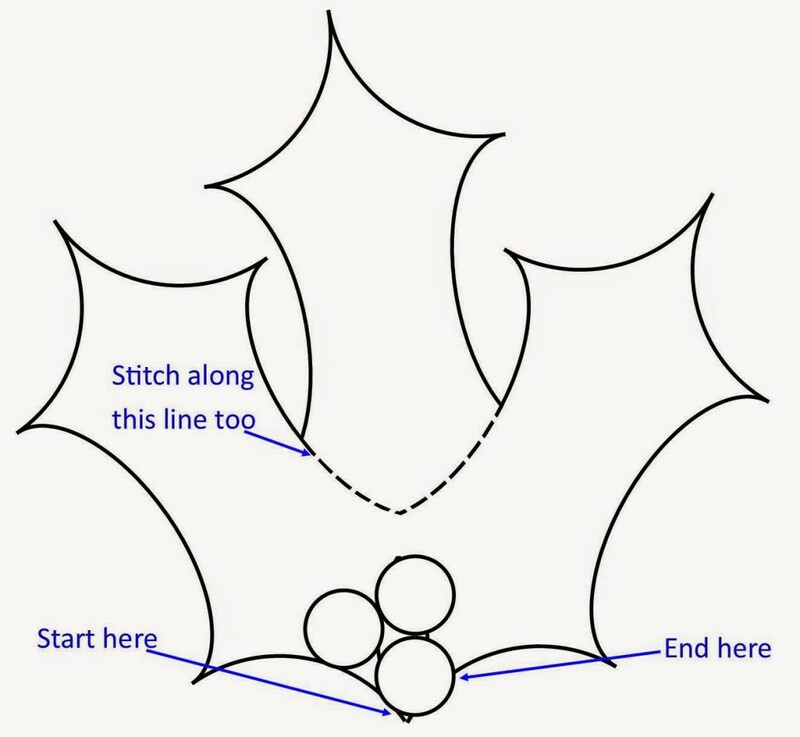 Using a 1/2″ seam, sew around all four sides, leaving a 5-6″ opening for turning. Clip the corners, turn and press, tucking the fabric from the opening area in. Topstitch around the mat 1/8″ and 1/4″ from the edges. Quilt the center as desired. 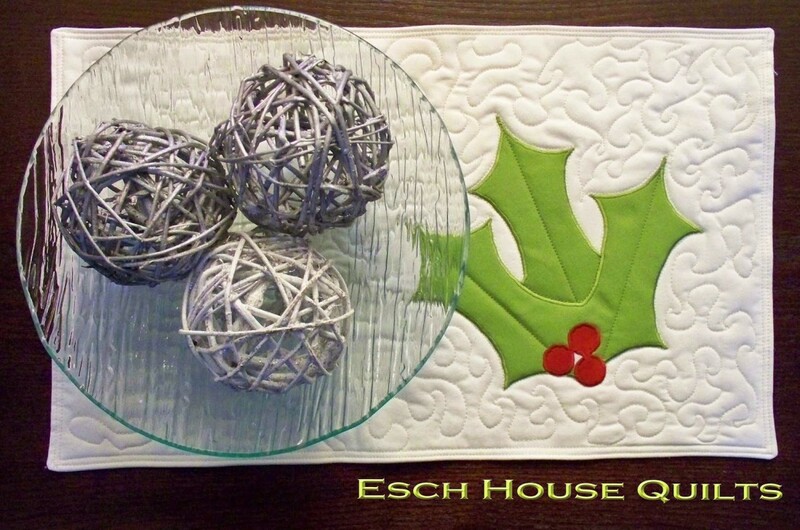 I quilted around the holly and down the center of each holly leaf and then meandered on the background. I hope this year of Sew Solid Sunday has inspired you to try a few projects using solids – whether one of the ones I’ve shared here or your own. What would you like to see from Sew Solid Sunday next year? I’d love to know and am open to your ideas. Now, let’s see what you’ve been doing! Such a cute holiday project Debbie. I've gone the opposite of solids and am enjoying a pile of Kaffe prints in reds and greens. Probably won't be done for Christmas but at least I'm inspired. Merry Christmas.